The other day, I wrote a small post on Genesis 22. You can read that here. I’d like to continue meditating on the implications found in Genesis 22, where God tests Abraham by telling him to sacrifice Isaac. In my previous post, I focused primarily on the fact that a substitute was provided on behalf of Isaac. In this way, Isaac’s life was saved, and the death was passed to the ram instead. This is a historical continuum found all throughout scripture, and it climaxes in the substitution of Jesus for the sins of mankind. 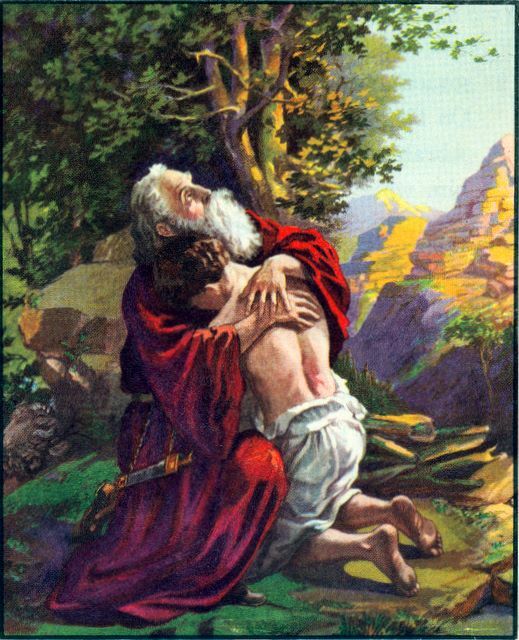 But now I want to look at Abraham’s love for his son Isaac. Three times in the text, God calls Isaac Abraham’s only son (v. 2, 12, 16); and two of those times, God refers to him as Abraham’s only loved son (v. 2, 16). All this focus on Isaac as being the only beloved son of Abraham is meant to illustrate how hard it was for Abraham to offer his son as a sacrifice to God. Of course, Isaac is not simply Abraham’s only son. But, Isaac was the promised son (Gen 12, 15). Isaac was the son through which all of God’s promises to Abraham (and the world) would be realized. Only ten chapters earlier, God appeared to Abraham and promised that through his seed, the nations of the earth would be blessed. The problem was, his wife was beyond child-bearing age. They were unable to have a natural-born son. In Genesis 15:2, Abraham offered his slave as an adopted son — God said no. Then in Genesis 16, Abraham decided to have a son by one of his servants, Hagar. While this was a technically a biological son, it was not by Sarah, so God said no to that as well. Finally, God miraculously gave Abraham and Sarah a son in Genesis 21. So, when God asked Abraham to sacrifice his only loved son, he meant: “offer the very promised son that I gave you” — the very one that would bring blessing to the nations! God wanted Abraham to give this one up. To Abraham, Isaac was much more than a child. This son was an encapsulation of all of God’s promises concerning Abraham and his descendants. This was a hard thing to ask of Abraham. And yet, when Abraham is asked to give up Isaac, he never once questions God. In fact, Abraham is astonishingly deliberate in his obedience. When God told him to kill Isaac, Abraham got up early (Gen 22:3), gathered his materials (22:3), and went immediately to Mount Moriah (22:4-10). Never once did he doubt God. In fact, Abraham trusted that God would provide (v. 5b, 8). The amount of forced obedience involved in going to sacrifice Isaac is absolutely incredible. It was so incredible, that when the angel stopped Abraham from killing Isaac, he said: “now I know that you fear God, since you have not withheld your only son” (Gen 22:12). Abraham’s fear and love for God was placed in the context of his willingness to give up Isaac. What a love Abraham had for his God! But we must also remember that God stopped Abraham from doing this — God provided a substitute for him. And so, Abraham did not have to go through with sacrificing his only son. And God did this because Isaac was not the ultimate son. He wasn’t the ultimate promised seed from whom would come blessing. The substitute of the ram pointed to a better son; and this was fulfilled in Christ (Gal 3:16). In fact, we are told in John 3:16 that Jesus is a fulfillment of Genesis 22: God so loved the world that he gave his only begotten Son. What this means is that as much as Abraham was obedient and willing to give Isaac, and as much as he had love for God, God is the ultimate Father proving his love for the world by actually giving his only Son. And this means that God’s love is infinitely greater. Can one even comprehend the unfathomable love the Father had for the Son? As much as Isaac was chosen, Christ was the ultimate chosen one one, chosen even before the foundations of the world (1 Pet 1:20, Rev 13:8). He is the ultimate Son who brings about the blessings promised in Genesis 12 (Gal 3:16). He is the true Israel who brings God’s people back from their wanderings and blesses the nations (Is 49:5-7). The love that God had for the Son was eternal, glorious, and perfect (John 17:5). And yet God, in his overwhelming love for the world (kosmos in Gk — this communicates God’s love not just for people, but also for the entire created order), actually gave his Son up as the true sacrificial Lamb (John 1:29). Abraham’s love is but a small glimpse of the love of God for sinners! In fact, Paul says in Romans 5:8 that God proves his love for us by giving Jesus as a sacrifice. He asks in Romans 8:32 (no doubt thinking of Genesis 22! ): if God did not spare his only Son, but gave him up for us all, how will he not give us all things? What Paul means to say here is that there is no greater love found in God than the gift of Jesus. So while Abraham loved to the extent of being willing to give up Isaac, God loved to the extent to actually giving up the eternal Son; and not only for one person, but for the entire world. What love God has for sinners!